My Shining carpet doormat idea might actually become reality thanks to Mid2Mod. 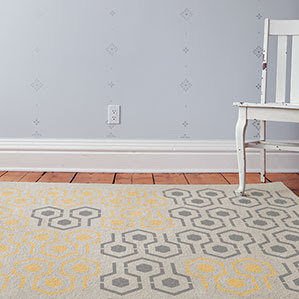 Vecco's Buzzed stencil looks a lot like the pattern in the Shining carpet. A little orange, brown and red colorant and you're there. Now I just have to decide how badly I want a Shining doormat. I kind of just want to buy my doormat and be done with it. On the other hand, their Diamond Bling stencil looks a lot like a certain logo that I'm rather fond of. Wow, I didn't realize how much that Vecco stencil looked like the carpet in The Shining. That really would make the perfect doormat. But then so would the Diamond Bling. By the way, thanks for the mention. That dormat looks fantastic. Is it real? Clicking through.